This is the agricultural murder mystery of our time. In a fascinating and in-depth Bloomberg piece, investigative reporter Christopher Leonard lays out the agricultural murder mystery of our time. Starting in February 2015, someone who had to have intimate knowledge of how factory chicken farming (including climate controls, fans, and alarm systems) works systematically murdered 320,000 chickens on several farms in South Carolina. Factory farmed chickens are raised inside chicken houses that are owned by contract farmers. These houses require special climate control systems to maintain optimal temperatures for the birds. Adult chickens require cool air to circulate, dissipating heat and steam. 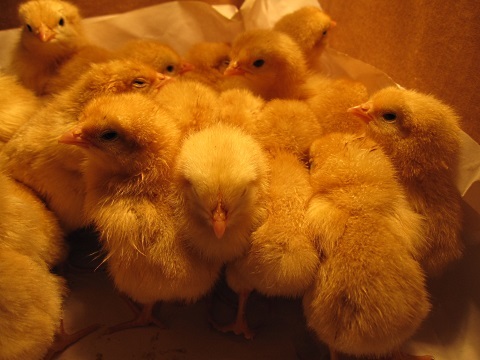 Young chicks like those pictured above require extra warmth so they can grow into healthy adult chickens. Both types of chickens are kept separately because of their different requirements. The person (or people) who systematically killed all these chickens clearly knew this. The first farm hit happened on February 17, 2015. Farmer Hoangson Nguyen received a call from an employee telling him to come to the farm immediately, and that something was terribly wrong. Nguyen arrived to find that the climate controls on one chicken house showed an internal temperature of 122°F. When he went inside, it was like a horrifying sauna, where chickens had pressed up against walls trying to get out as they were smothered by the climate control tampering. It gets worse: Elsewhere, baby chicks all froze to death while still trying to huddle together for warmth. After all the chickens were killed, Pilgrim’s Pride lost about $1.7 million worth of birds. But the farmers lost an estimated $10,000 per chicken house—an unfathomable amount for people who are already living below the poverty line. A lot has been written about factory farming, and chicken welfare in general. What’s starting to get more attention is how this all affects the farmers themselves, who are basically in insane amounts of debt to banks. These farmers rely on their contracts with huge companies like Pilgrim’s Pride (which owned all the chickens killed in South Carolina) , Tyson, Perdue, and Sanderson Farms so that they can make payments on those debts. Leonard also explored this particular wrinkle of the American industrial meat system in-depth in his book, The Meat Racket. Farmers own the land and facilities where the chickens are raised and fattened to become the nation’s favorite meat. However, farmers don’t own the chickens themselves. At the end of the process, the companies weigh the chickens in a “tournament system” to see how much grain they’ve converted into delicious, fat, saleable meat. Then, the farmers who have the fattest birds using the least amount of grain get a bonus. Farmers with the lowest weight get their pay severely (and disproportionately) docked. In other words, it’s a zero-sum game: Farmers are effectively pitted against farmers, because one farmer’s bonus is coming out of his neighbor’s pocket. Nguyen told Leonard that if you go to a meeting of Pilgrim’s Pride farmers, none of them actually speaks to each other because tensions are so high. Even though it was clearly beyond Nguyen’s or any of the other farmers’ control, Pilgrim’s Pride included the birds killed as part of this mass chicken killing spree in those tournament numbers. That meant Nguyen came dead last in the tournament, and was found to actually owe the company $12,961.61. Sheriff Randy Garrett’s investigations led him to James Lowery, a farmer with whom Pilgrim’s Pride had not renewed its contract (Lowery was not “fired,” PP was quick to tell Garrett) after Lowery had neglected a Pilgrim’s Pride chicken flock so badly, the company determined that he was in violation of their animal welfare policies. Cell phone records showed that Lowery had been on-site at all the farms where the murders had happened, in the middle of the night when they were committed. The farms were all difficult to get to, and not easily accessible via main roads. The Associated Press reports that in May, charges against Lowery were dropped after a judge said there wasn’t enough evidence to move forward with the case. However, Leonard reports that federal investigators may charge Lowery with tampering with the food supply—which is a felony that bears a sentence of 20 years per count. For a full and detailed account, Leonard’s entire chilling piece is well worth reading.